The purpose of this series is to illustrate how to double your email recruiting results. Your battle plan is the foundational strategy for the battle of the inbox on the digital battlefield. 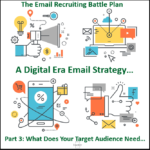 To maximize the impact of your email recruiting campaigns, you need a digital strategy. This is the third piece to the puzzle of why a strategy is required to achieve promised improvements in your email success in this unique digital era. This third piece to the puzzle depicts the needs of your target audiences. This piece together fits nicely with the other two pieces (audience makeup and thinking) to complete the picture of the target talent persona.